Dude of the House: Who Likes Chocolate? On the Jewish holiday Passover, we ask “Why is this night different from all other nights?”. The question is answered and the evening moves on toward an ultimately very bland meal. So on this February 15th, I’ll ask you how your Valentine’s Day was different from all other days? My V-Day consisted of a dinner of Kraft Mac and Cheese and an exhausted wife who passed out while I was brushing my teeth. I can’t blame her, though. Between the flossing, brushing and Listerine the process takes almost an hour. But I’d rather spend the time doing that, then driving to see my dentist, Dr. Quiverfinger, again. We did have lunch at one of our favorite restaurants that we rarely get to anymore. Sure, my brother who was visiting from out of town was there. As was an antsy 2 year old that I had to stop from knocking over the giant gumball machine more than once, but that was all part of the fun. 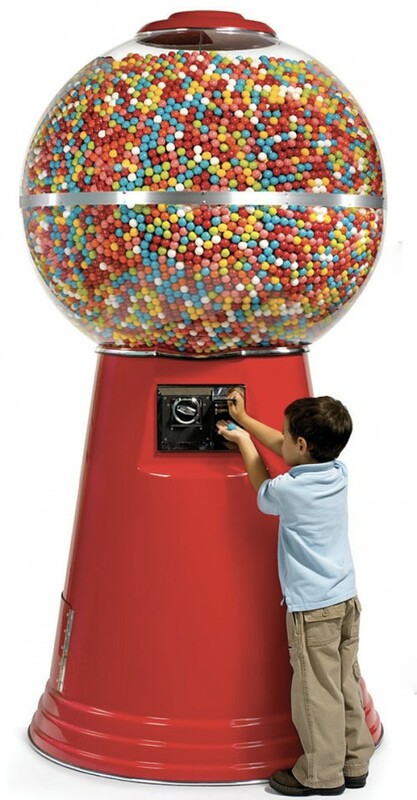 It would have been much less fun if I’d had to spend $500 on gumballs and a new machine. Speaking of gumballs, which I’ve never understood the appeal of since the taste wears off before the gum hits your tongue, we are going to try something new today. Thanks to The Sweet Spot, I am going to host a special giveaway for some lucky readers. Do you like chocolate? If not, does someone you live with or know? In my house, I’m the only one who does and since my pants barely fit anymore, I’m going to share these treats with you. The Sweet Spot donated some fancy chocolate hearts and some fancier shiny metallic pink chocolate orbs that I’m going to find new homes for. This isn’t the cheap stuff either. This is super-fancy schmancy chocolate, according to some chocolate experts I know (my tongue and my stomach). So what do you have to do to win? Cash helps. Just kidding. A new car would be nice. Actually, the first thing is you must LIKE The Dude of the House on Facebook and/or follow me on Twitter. If you do both, you just increased your chances of winning by having two entries. Pretty easy, huh? Want a third chance to win? Go to my blog, select a RANDOM blog entry from any month in 2011 (link to all posts is on the top, right margin of each blog page where it says "All the Dude's Posts") and leave a comment about it. Tell me what you thought about it, what you liked or didn’t like. As part of your comment, tell me that you wish to be entered into the random drawing. OK, not enough options? Thanks to a reader named Staci's suggestion, whoever refers the most people to my Facebook page also wins. So when you tell your friends to come visit, tell them to say "Herschel Krustofsky sent me" or "XYZ Blog sent me". Fellow bloggers can win too. Because I know they really need the chocolate to come down from all the Red Bull. So when do you get your chocolate, because YOU are sure to win? After I reach 1,000 Facebook “Likes” and 1,000 Twitter followers, I’ll choose the winners at random (other than the "most referral" winner). It’s not that hard. If everyone tells a friend or 50, we could get there by dinnertime. Up to you. Until then, I’m going to finish the half-price Christmas candy I still have around the house. OK, it’s actually from Halloween. I mean Easter. Fine print: Winners must respond within 48 hours of being notified or I will pick new winners. I pick which prize you get. Trust me, they are all good. No whining. I like dark chocolate more than milk chocolate and commented on last night's posts before I knew about the contest or would have waited till the contest to comment on the post. Does that still qualify? Hey Puck, Yes you'll still qualify. Make sure to tell your friends to Like my page. Thanks for stopping by. I love chocolate but actually ended up here because Mom-troversy pimped you out and after having read a couple of your posts, your funny!!! Thanks, Diamond. Glad you enjoyed. Come back soon! Who doesn't like chocolate? Chocolate shares the throne with coffee as the elixir of life!